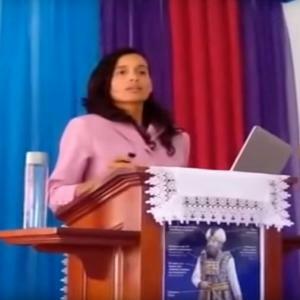 The month of June 2017 saw the rise of a new Adventist “prophetess.” Daisy Escalante, the founder of an independent health ministry in Puerto Rico claims to have been receiving dreams or visions from God for the Adventist Church. These messages have apparently been received since at least April 2017 but have only recently started circulating on the internet. All of Escalante’s “revelations” are found in about three hours’ worth of YouTube audios in Spanish; most of it appears to have been prepared in advance. The audio messages have caused considerable consternation among Spanish-speaking churches. Escalante’s tearful admonitions present either an angel or Jesus speaking directly to her. They paint a dire portrait of the spiritual condition of the Adventist church; there’s a plethora of rebukes for its apostasy and repeated calls to reformation. The words “anathema” and “abomination” appear frequently. In an audio titled “The Destruction of My People Is Imminent,” she claims to be shown an Adventist church building from whose foundations emanate ghastly, winged beasts intent on devouring its members. In the same vision, a couple is seen in one of the rooms of the church in an adulterous relationship which symbolizes the spiritual state of the Adventist Church. A common thread is the repetition of themes found in Ellen White’s writings. Escalante exhorts Adventists to leave the cities and their local churches where there is “too much sin” and move to the countryside. Like Ellen White, Escalante has an “accompanying angel” who warns about the impending “destruction” of the Adventist church. Escalante feels weak when receiving the revelations; the expressions “I was shown” and “I saw” appear frequently. Descriptions of scenes which seem to parallel biblical passages fill large segments of the audios. Intertwined with what appears to be sincere appeals to sanctification, Escalante addresses the “old landmarks”: Jesus frowns upon Adventists who cook and iron their clothes on the Sabbath, condemns any type of adornment and calls “female priests” an “abomination,” among other diatribes about lifestyle. A former edition of the Spanish hymnal Himnario Adventista without musical notation is called “inspired” while the new edition with musical notation is not inspired. And there are the usual attempts at setting dates for the Second Coming. In an example of “soft dating,” Escalante states that Jesus is “one minute” away from putting on his royal robes to return as “King of kings and Lord of lords.” She then offers new light on the sequence of end-time events: the 3.5 years (1260 days) of Daniel and Revelation commenced on Sept 23, 2015 during Pope Francis’ visit to the U.S. and will come to an end in 2019 with the establishment of a national Sunday law. That same date in 2015 marks the beginning of the judgment on the living. Escalante’s incoherent “testimonies” are far too long to analyze at length here. But an important pattern emerges in her experience: similarly to White’s contemporary Anna Rice Phillips (1865–1926), Jeanine Sautron in the 1980s and more recently Ernie Knoll, all of Escalante’s messages are given in private. At one point Escalante says that God purposely chooses to reveal things at night. Sautron’s songes et visions never underwent independent verification; Ernie Knoll claims to receive dreams. It is undeniable that dreams were an important mode of divine communication in biblical times as in the case of Jacob (Gen 28:12), his son Joseph (Gen 37), Mary’s fiancé Joseph (Matt 2:12) and Pilate’s wife (Matt­ 27:19) to name a few. The interpretation of “prophetic dreams” at times required the intervention of an equally inspired third-party, as in the case of Pharaoh and Nebuchadnezzar. But dreams are also seen as questionable sources of revelation; Jeremiah 29:8 warns against listening to the dreams of prophets who lie in the name of the Lord: “See, I am against those who prophesy lying dreams, says the Lord, and who tell them, and who lead my people astray by their lies and their recklessness, when I did not send them or appoint them; so they do not profit this people at all, says the Lord” (cf. 23:25, 32). In Deut 13:1-4, prophetic dreams are mixed with error in order to “test” Israel. Amidst the ostensibly chaotic, charismatic worship in Corinth, Paul requires that special revelations be interpreted by an equally inspired interpreter (1 Cor 14:27) otherwise, the recipients of said epiphanies should remain quiet. This provided an important control against claims of private revelations. “Prophecy” warns Peter, is not the fruit of “one’s own interpretation” (2 Peter 1:20). The reason for caution in the acceptance of dreams seems obvious: differently from visions, which can sometimes occur in public, dreams are largely personal occurrences which lie outside the tangible realm and whose validity cannot be independently verified; they exist solely in the visionary’s brain and befall in the dead of night. It is therefore curious, if not suspicious, that most of these self-proclaimed visionaries claim to have received dreams. Those who’d like more evidence are then branded incredulous and themselves serve as fulfilment of the “apostasy” predicted in them. The dreams become a self-fulfilling prophecy, regardless of what they actually mean. Case in point: in a comment on Facebook, Escalante’s husband derides the skeptics while claiming that thousands have been blessed by her messages. He condemns the “abominations” found in the “rebellious” Adventist Church. As an Adventist, I always find it disconcerting to be confronted with binary, “yes/no” answers to these claims to the prophetic gift. “Could this be a fulfilment of the eschatological ‘dreamers’ predicted in Joel 2:28?” I wonder. For a church whose belief system is firmly moored in the manifestation of the eschatological “spirit of prophecy,” such ambivalent manifestations present a problem. For one, this belief makes Adventism especially vulnerable to itinerant “visionaries.” The irony for us is to outright reject any new, non-canonical prophet while simultaneously holding belief in a modern-day prophetess. In a Spectrum article about the dreams of Ernie Knoll, Loren Seibold mused: “In this era of microscopic scrutiny, could a real prophet survive debunking long enough to be heard?” Jumping to conclusions presents two risks: too quickly accepting what is at best the mere fruit of Christian piety and at worst plain charlatanism/opportunism or rejecting what could, in fact, be a genuine gift. No doubt the apocalyptic framework attendant to these neo-prophecies complicates discernment for many. 1 John 4:1 recommends “testing the spirits” rather than embracing or outright rejecting them. The preferred proof-text against such new prophecies is Isa. 8:20: “to the law and the prophets.” But what if the messages in and of themselves have nothing against “the law and the prophets” necessarily? What if they inspire other Adventists to re-consecrate their lives and join the “revival and reformation”? Would a pragmatic, fruits-oriented approach validate such voices as gifts of the Spirit? Pentecostal denominations, where tongue-speaking, extemporaneous prophesying, and impromptu revelations are common, have surrendered their ecclesiological practices to easy interpretations of the biblical passages dealing with charismatic gifts and encourage a copy-and-paste mimicry of the goings-on of the Corinthian church. Adventism has not been immune to these; as early as the 1860s, tongue-speaking, swimming, and crawling in the Spirit occurred sporadically in our ranks, as in the infamous case of Sammy Hancock. Since the epochal camp meetings in Indiana in the summer of 1900 when the holy flesh movement came to a head, Adventists have sought to keep a great distance from this species of “fruits of the Spirit” lest we start down a slippery slope and end up meddling in the “occult.” We have ever since looked with suspicion at anyone claiming “new light,” be it in the form of supernatural revelations or new interpretations of Scripture. Our worship services are highly planned; spontaneous effusions of “the Spirit” are discouraged both in public and in private. Thus the norm in Adventism has not been sympathy, but a knee-jerk rejection of contemporary prophets (a reaction that is not necessarily new; cf. Mark 6:4). Ellen White herself encountered significant opposition early on to the point that joining the fledgling band of Sabbath-keepers (ca. 1860) did not require acceptance of her gift (cf. Testimonies, vol. 1, p. 328). In time however, her superior – although not unassailable – gift became the template against which new prophets were tested. When Ellen White passed away in 1915, we lost our Urim Thumim. There have since been dozens of self-proclaimed prophets in Adventism and all of them have so far been considered spurious, in part because they somehow contradicted Ellen White. Her books, the very source of most of the imagery used by these “prophets” turned out to be their Achilles heel. Thus Adventism’s belief in the eschatological “spirit of prophecy” has been safely circumscribed to the prophetic ministry of Ellen White, 1844-1915. Our early experiences with the charismatic honed our skills to test these manifestations; we have our own, no-nonsense checklists before we can accept their divine origin. Some of these “revelations” are childish (e.g., Jesus warns Escalante to respect a snail), others are inconsequential religious expressions, and many repeat prior revelations. Still others are plainly absurd, as in the case of the four Adventists from Hamburg, Germany in the 1960s. They claimed to have received independent revelations that the Adventist Church should join a so-called “League of the Friends of the Animals” and turn the care of animals into a central tenet of Adventist belief. At the behest of their heavenly messenger, they traveled to the “other side of the ocean” in search of an “ill, old wise man,” and visited the GC headquarters to present their case. Most of all, the church has profited little from these cases, except for the sharpening of our weapons against them. In the case of Escalante, her claims are demonstrably false: her unoriginal pontificating appears to be the product of ultra-conservative Adventist piety suffused with last-generation perfectionism, a critical, pharisaical bent cloaked in pseudo-celestial supplications, all of this bathed in a fertile, religious imagination and, perhaps, some unidentified personality disorder which enables her to lie with a straight face. And unfortunately, there still remains an audience for this kind of exercise in Adventism, one made up by those who live on the fringes, where unbalanced, self-serving views on eschatology, soteriology, and Christian living flourish. At the end of the day, this fresh specimen of false prophesying cheapens the work of the Holy Spirit and reveals the flaws in many an Adventist’s understanding of that gift. It appears then that, despite their inherent falsity, such claims to the prophetic gift will likely continue to test our understanding of the eschatological “spirit of prophecy” and its implications for the church. André Reis has published articles and book chapters on theology, church history, worship and music. He has recently finished a PhD in New Testament at Avondale College. If you respond to this article, please: Make sure your comments are germane to the topic; be concise in your reply; demonstrate respect for people and ideas whether you agree or disagree with them; and limit yourself to one comment per article, unless the author of the article directly engages you in further conversation. Comments that meet these criteria are welcome on the Spectrum Website. Comments that fail to meet these criteria will be removed. Do We Really Have the Freedom to Choose? She then offers new light on the sequence of end-time events: the 3.5 years (1260 days) of Daniel and Revelation commenced on Sept 23, 2015 during Pope Francis’ visit to the U.S. and will come to an end in 2019 with the establishment of a national Sunday law. That same date in 2015 marks the beginning of the judgment on the living. If one accepts the ministry of Ellen G. White as being from God, then this women is a false prophet, if for no other reason than the statement quote below. "There will never again be a message for the people of God that will be based on time. We are not to know the definite time either for the outpouring of the Holy Spirit or for the coming of Christ. " The Advent Review and Sabbath Herald. Mar. 22, 1892. Also there is no logical reason or biblical precedent to attach any chronological importance to the visit of Pope Francis to the US. “Let all our brethren and sisters beware of anyone who would set a time for the Lord to fulfill His word in regard to His coming, or in regard to any other promise He has made of special significance” (TM 55). “Our position has been one of waiting and watching, with no time proclamation to intervene between the close of the prophetic periods in 1844 and the time of our Lord’s coming” (10MR 270). Also, if this woman is prophesying the destruction of the Seventh-day Adventist Church, she is likewise proving the falsity of her prophetic ministry, as Ellen White repeatedly foretells that even though the great majority will be removed from its fellowship during the end-time shaking, that the church will go through triumphant and victorious (see 2SM 380; 4T 89; GC 608; 12MR 327; 20MR 320; 6T 400-401). There have since been dozens of self-proclaimed prophets in Adventism and all of them have so far been considered spurious, in part because they somehow contradicted Ellen White. Her books, the very source of most of the imagery used by these “prophets” turned out to be their Achilles heel. Is that true? In my reading of these supposed prophets they cling incredibly tightly to EGW views and I would love to know where they diverge from EGW. In your reference to a couple of other supposed prophets you did not list any statements that they made that opposed EGW so if that was the Achilles heel I would expect that such contradictions would be well known. They are not however, because the style has always been to mimic EGW, that and it is always easy and true to condemn the Adventist church, You will never been wrong when pointing out the problems of the imperfect around you! The false teaching of EGW being a prophet has lead many astray but unfortunately the error is not in SDAism alone. Thousands have died and will continue to die because of this specious heresey as is being witnessed daily in the middle east and elsewhere. One would expect that all of us, who purport to believe that Jesus is coming soon and that before He comes “sons and daughters will prophesy” (Joel 3:28-29), would rejoice that Daisy Escalante is receiving dreams and visions from God. Apparently, she has said some goofy things. So did Ellen White. Daisy Escalante apparently believes that Jesus is coming on a date certain. Ellen White also believed that Jesus would come on a date certain–October 22, 1844. I doubt that the Holy Spirit, whose ways are mysterious, has ever made the perfect the enemy of the good. Let us pray and in all charity expect that Daisy Escalante will be a net positive for the Kingdom of God. We certainly cannot dismiss her because she criticizes the Seventh-day Adventist Church. The function of a prophet is to admonish and rebuke the kings and priests in the land and every single prophet has done so. It is doubtful that there is a doctrine, text, or word that she can illuminate for me, but in all fairness I am not a member of her target audience. I am not a simple Puerto Rican. God necessarily condescends to particular groups of people He is trying to reach, and Daisy Escalante may be the instrument He has chosen for a people our biblical scholars are understandably incapable of reaching. Independent ministries all over the world find justification for their existence in the innovative and creative way they can speak the language of the people they are trying to reach. I am loathe to opine that she might be crazy. I could spend one Sabbath with the GC president, one Sabbath with the conference president, one Sabbath with a Seventh-day Adventist supporter of Donald Trump, one Sabbath with one of our famous evangelists we all know well, and one Sabbath with Daisy Escalante. If I were to be asked at the end of the month to identify the crazy person who visited my house, I cannot predict right now what my answer would be. All I can offer is that my answer, if I did not wisely demur, would probably be biased and subjective. This comment is not an endorsement of Daisy Escalante but generally a caution that we avoid trying to dictate the blowing of the wind. Kevin, I think we agree that the prophetic experience cited here is not a threat to Seventh-day Adventism. That said, I checked each of the citations your have listed and I failed to find any suggestion that could possibly be reflected in your assessment that ‘the great majority will be removed from its [the denomination’s] fellowship during the end-time shaking’. Indeed none of the Ellen White citations you listed reference a ‘shaking’, though some do indicate that some will leave the church and some who have left will attack the doctrines of the church. Your are, though spot on with your taking note that Ellen White was consistent across her denominational ministry opposed to setting a date for the return of Jesus. Seventh-day Adventism was done with that the morning of October 23, 1844. Seventh-day Adventism was also resolute throughout Ellen White’s remaining 71 years in not only resisting, but robustly opposing the creation of a list of Fundamental Beliefs for the same reason. One thing that also seems obvious across the corpus of her writing is that Ellen White consistently confirms God’s support for the people of Seventh-day Adventism and their faith, and always at the expense of denominational leaders clamoring for the preservation of the historical denomination at the expense of its honest in heart members. Ellen Whits sensed a future for the people of Seventh-day Adventism in which some would leave, but Ellen White offers no evidence that she was instructed that the church would save itself by splitting over ecclesiastical issues, let alone doctrines. Quite the opposite. And thank you to putting me on an investigator track clarified that for me. I needed that kind of clarity on this very matter. Thanks, again! Since i was probably 15 when I first heard EGW name, I have tended to measure any and all information I receive from the church and its mouthpieces, by what I read in the Bible; and, I still measure, even the plethora of red books and the many compilations of therm found at any ABC, by the same. It has never helped to find that EGW contradicted herself - or changed her mind; or God did - on many issues. Of course reading anything in context helps to solve a lot of such problems, but then, when someone is out to prove the validity of their views, who cares about context. It might be too much to hope that the rank and file of the church can now understand why non-SDAs are reticent to accept - hook-line-and-sinker - everything the church claims to be “gospel”, based on “their prophet”. Of course, non-SDAs have had the same reaction to EGW that most SDAs have for this lady. The bottom line - Jesus promised us the Holy Spirit to guide us into all truth. This was a promise to each and all sincere seeker of truth. By discounting our own personal connection to that Spirit, we are abdicating our destiny to another mortal, much like ourselves. That is how cults are born. UH…has the GC ever thought of driving surveys to see what % of SDA members have ever read any of EG White’s books…starting with the smaller “Steps to Christ” ? Not a few SDA pastors & sabbath school teachers avoid using SOP in sermons/classes and /or have negative feelings about her writings. EG White is certainly not a darling of most members of the current SDA church. I can read quotes from her and actually get elders mad! How does this one grab you? “But, but, but,but…you quoted that out of context.”…I will hear. Am I supposed to read out loud the whole chapter or book to them??? You need not stand where you say, ‘I do not know whether I am saved.’ Do you believe in Christ as your personal Saviour? If you do, then rejoice" (General Conference Bulletin, April 10, 1901 emphasis supplied). Is this another case where EG White is speaking with a forked tongue? I think my quote gets more exposure, because it is from COL, than the quote you posted. By the way, your bolding of the words…“He accepts us” does not invalidate the COL quote. Also, at face value, the COL quote is more comprehensive in its application than the OSAS issue. In realistic application, the Holy Spirit speaking to the conscience is the real evidence and/or proof. Most SDA actually suffer from almost constant guilt trips. We as a eschatologically obsessed church seem to have attracted (or created??) these kind of people, harvesting religious nuts by the bushel. When the orchard owner returns to pick up his spiritual fruits we may be found light on the scale. No amount of legalistic thumbs will tilt it in our favor, although this will unsurprisingly not stop anyone guilty from trying. How do we become relevant in the trenches, now, to the lost and hungry? How do we embrace the meta-message of “brothers keeper”? I posit, not the way we’ve been playing church thus far, burying talents in our obsessions. Even before Ellen White, Daniel 7 points to when the 1260 days begin and it is part of the 2300 day prophecy. So if her theory was accepted it would sweep away Adventism. It strikes at the heart of adventism the 2300 days. I find it curious that the bible wasn’t mentioned as a rebuttal to that supposed “prophetess”. There really needed to be no mention of Ellen white to refute that and I think that it would have been good practice to judge it by the bible first. That is an area that is clearly spoken of in the bible, so biblical references should have been used first and then Ellen White references after to support what the bible already said. Ultimately I don’t know why scripture wasn’t used to compare to the statements. "The forty and two months are the same as the “time and times and the dividing of time,” three years and a half, or 1260 days, of Daniel 7 - - the time during which the papal power was to oppress God’s people. This period, as stated in preceding chapters, began with the supremacy of the papacy, A.D. 538, and terminated in 1798. At that time the pope was made captive by the French army, the papal power received its deadly wound, and the prediction was fulfilled, “He that leadeth into captivity shall go into captivity.” GC:439. No, Ellen Harmon believed in Oct 22, 1844 i.e. before she became the Lord’s messenger and subsequently Ellen White. Splitting hairs? I don’t think so. Maybe not the whole book, or even the chapter. But enough so as to not to butcher it. “Peter’s fall was not instantaneous, but gradual. Self-confidence led him to the belief that he was saved, and step after step was taken in the downward path, until he could deny his Master. Never can we safely put confidence in self or feel, this side of heaven, that we are secure against temptation. Those who accept the Saviour, however sincere their conversion, should never be taught to say or to feel that they are saved. This is misleading. Everyone should be taught to cherish hope and faith; but even when we give ourselves to Christ and know that He accepts us, we are not beyond the reach of temptation. God’s Word declares, ‘Many shall be purified, and made white, and tried’ (Dan. 12:10). Only he who endures the trial will receive the crown of life (James 1:12)” (Christ’s Object Lessons, p. 155, emphasis supplied). “Each one of you may know for yourself that you have a living Saviour, that He is your helper and your God. You need not stand where you say, ‘I do not know whether I am saved.’ Do you believe in Christ as your personal Saviour? If you do, then rejoice” (General Conference Bulletin, April 10, 1901 emphasis supplied). “The message from God to me for you is ‘Him that cometh unto me, I will in no wise cast out’ (John 6:37). If you have nothing else to plead before God but this one promise from your Lord and Saviour, you have the assurance that you will never, never be turned away. It may seem to you that you are hanging upon a single promise, but appropriate that one promise, and it will open to you the whole treasure house of the riches of the grace of Christ. Cling to that promise and you are safe. ‘Him that cometh unto me I will in no wise cast out.’ Present this assurance to Jesus, and you are as safe as though inside the city of God” (Manuscript Releases, vol. 10, p. 175 emphasis supplied). Well if they use her writings like you do, I hope they never read her books. More like a case of people only quoting sections of her writings to try and make her say something she doesn’t believe. When you look at all those things I provided above it clearly shows that Ellen White did believe you can be sure of your salvation. Have you joined Ellen in forgetting her predictions of 1846 and 1851? Why do we think her writings demonstrate inspiration? The Papacy was neither established in 538 nor terminated in 1898. “Therefore behold, I am against the prophets,” says the LORD, “who steal My words every one from his neighbor. “Behold, I am against those who prophesy false dreams,” says the LORD, “and tell them, and cause My people to err by their lies and by their recklessness. Yet I did not send them or command them; therefore they shall not profit this people at all,” says the LORD. Nearly 20 years ago, I had just read this part of Jeremiah when my mother – a devoted fan and financial contributor – mailed me a copy of the ‘3ABN Story’. So, I was startled to hear the same words – ‘I had a dream’ – coming from an apparently highly-respected American SDA media ‘star’. 3ABN was supposedly blessed by God to be a vehicle for better delivering the ‘3 Angel’s Messages’ to the world. Now those ‘3 Angels’ (or ‘messages’) have become 3 unintelligible ‘swoops’ in the 3ABN logo, and the ‘vehicle’ has been crippled by its founder into a ‘wheelchair’. How can an intelligent SDA church member, with even a basic grasp of the symbolism of ‘Revelation’, be fooled into supporting with cash – or even merely attention – a TV network founder’s ‘dream’, even after it has proven itself to be leading directly to the ‘nightmare’ described in Revelation 14:9-11, regarding the fiery results of worshipping the ‘beast’ and/or ‘its image’ ? We SDA prophecy experts don’t like admitting that we have been snookered by dreamer-prophets, even when the living proof of the fact is all that is left to grasp. But, here attached below, is the evidence that the ‘3ABN’ ‘dream’ has led its founder to lead his fans right into that final ‘union of church and state’, in America, which forms to make the ‘image’ of the ‘beast’ warned of by the ‘3rd Angel’s Message’ . . . and it was posted on You Tube by its proud author, himself ! ? In 1893 – at the time of the World’s Columbian Exposition held in Chicago, Illinois, USA – under political pressure from non-SDA, Sunday-keeping American Protestant religious leaders, the National U.S. Congress strongly reinforced the practice of ‘Sunday Laws’ in America. They even adopted the Roman Catholic version of the ‘10 Commandments’ into a ‘bill’. In doing so, ‘America’ has already defied the Creators of the Sabbath, and is guilty of insubordination. ‘God’ created the human ancestors of ‘Caesar’ on the 6th day (NOT vice versa), just before asking them to celebrate and ‘rest’ with ‘God’ on the 7th. How can I be led to be ‘one’ in heart with a government that has defied the Source of its authority, and will sooner than later use their proud military forces and flag to persecute their own subjects – like me ? I would much prefer to be ‘one’ with the Source that America has almost totally abandoned . . . with the added incentive of escaping the ‘torment’ of the Sodom-like ‘fire and brimstone’ described by the 3rd Angel. It would seem that we SDAs have been living under the spell of ‘false prophets’ for decades, now. It is high time that we wake up from their ‘dreams’. The SDA church has been rife with prophetesses throughout its history.Even as a boy of 14/15 0r so I used to be hugely entertained when Sister Plunkett used to suddenlt rise to her feet and stand rigidly even during the sabbath sermon and start babbling then speaking very loudly about named backsliders and what messages she was given by the Lord about their fate if they did not frepent , and so on. As a boy I loved to see the tussle between herself and the deacons sent to remove her from the precints of the building and sometime even the churchyard itself esp. since she often spoke from outside the church building and continued to name some members(including some of the very deacons themselves, hahaha) in a loud voice. I do not know whether Daisy Escalante is a bona fide messenger of the Elohim but I would not deny the possibility of this being so unless she is PROVEN false, by one means or another, which of course would be a massive task. May I say it doesn’t look good for other SDA prophets. George Knight may disagree with me on this one but there has been numerous claims at prophethood and all fail the test but why do they fail? They fail because the SDA church puts Ellen white as an infallible interpreter of scripture in a 1976 sabbath quarterly claims ‘We have an inspired interpreter of the old and new testaments and an advantage’. The SDA encyclopaedia states the best presentation of the investigative judgement is found in the book The Great Controversy by Ellen G White. Ellen white also promoted the Arian heresy the belief that Jesus is not God as did the early Adventists such as Uriha Smith putting the church at that time outside of the Christian church. To Ellen Whites credit she saw she was wrong and changed her position to embrace the Trinity and the incarnation. The problem of Arianism is still in the church today and i believe could be solved by repeating as a church the acceptance the Nicean creed or the Apostals creed as a clear and simple statement of faith from the very beginning of the christian church rather than the 28 fundamentals. The early creeds were baptismal statements dated from the first century and units christians through history. The books that Ellen White plagiarised were written by christians of other denominations Anglicans especially and are those writers inspired too? Or was Ellen White only inspired to copy. Ellen White is forgiven much by the church but others are judged harshly. The reason for this is that Ellen White is untouchable by mere mortals such as us and the church has promoted her from the beginning of its history to confirm its correctness and its authority by divine intervention but the bible says to’ test the prophets’. The bible is the most important record of Jesus we have and can’t be replaced by any prophet of the 21st century or the 19th century. The answer is, I believe modern prophets can exist but we shouldn’t place so much authority on them because I believe Ellen White held to the bible and the bible only although at times she may have exaggerated her own ministry.